Hindaun itself is unique in its historical treasures from decades ago. Timagarh Fort exceptionally adds a flavor to it. The fort includes the apostle of the Mughals. It is famous for its ancient astadhatu and stone idols. Let’s hunt back the story behind Timangarh Fort. Timangarh Fort was built up in the second century. Yaduvanshi Raja Timanpal had a great contribution to this fort. The Fort derives its name “Timangarh” from the king Timanpal. Later on Mughals had taken over the fort and ruled. There are many entrances in the fort. There is a rumor about the fort in the neighboring village. The fort bears a curse of Natni who was a great Trapeze artist. The prevailing king asked Natni to walk over a Rope to a fixed destination. The king had promised to give Natni half of his Kingdom if he (Natni) returned successfully back on that rope. Natni reached the destination to the utter surprise of the King. While he was returning back on that rope the queen got confused of his success ordered to cut the rope in middle. Natni knocked over and died. Due to this injustice Natni left a curse for the King that one day his kingdom would be in ruins. The residence of the fort had left this fort before the curse came true but it is said among the villagers that many of the residents also turned in stones inside the fort. The curse came true now. The fort is now desolated and ruined. The architecture of the fort is a unique sign of India’s Ancient history. Mostly Five gates or darwaza were there for the entrance to the fort. 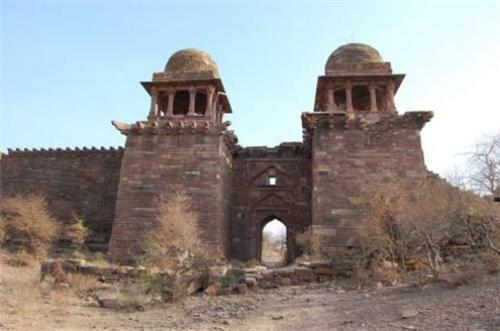 Later the Mughals have added a many entrance to the fort. The walls of the fort are curved with many stone sculptures. One can observe a picture of the prevailing society. The people, the town, the bazaar all are engraved on the walls of the fort. Many Gods and Goddesses are also indebted on the stone pillars. People of different profession on the walls will take you back to their time. It could be known from the excavators about those sculpted idols and the pictures. 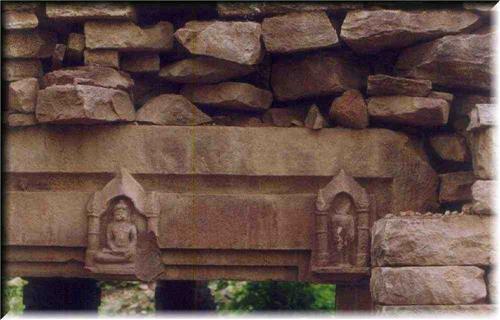 Many religious and geometrical flower specked sculptures could be seen at the roof top inside the fort. Today a dense bush had paved way through the Fort. There are many other places that you can take as adjacent visiting place to Timagarh Fort. City palace, Kalia Devi Temple, Shri Mahavirji Jain Temple are also centre of attraction near the Timangarh Fort. 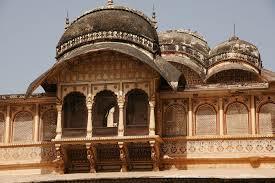 Those places also signify and add glory to Rajasthan’s old treasures. Most importantly Natni’s pillar is also a visiting place for many of the tourists who believe in the story behind Timangarh Fort. You can plan to stay the night after visiting Timagarh Fort and the other centre of attraction near this place. The Sidharta Resort and Bhanwar Vilas Palace Hotel are the hotels nearby the Timangarh Fort. You can even travel back to Jaipur (145 Km) to get a number of lustrous hotels to relax in. If you want to visit this place with family is February, March or September to December. The climate of this place is very hot and moreover this is an isolated place. So it is advised to visit this place in broad daylight. So that you can get enough convenience and can avoid all sorts of risk factors. The Timangarh fort is situated at Karauli District at Rajasthan in Mashalpur sub-Teshil. By Road: You can reach the city of Hinduan by road with a taxi or Bus. Rajasthan state highway would be the best option. By Air: Agra airport would be the nearest airport nearest to this place. By Rail: Gangapur city train station junction would be the nearest railway junction to this place. You can take any jeep or van from there to reach the Timangarh fort. Timangarh Fort including all other forts in Rajasthan makes the entire incredible India. No matter you belong to which caste and creed, by visiting Timangarh Fort and knowing the history associated to it you would feel enormous pride for India’s ethnic Heritage culture. Pocket your camera and set off today to discover a never seen Hindaun.